Stepping into the shoes of the boutique's other designer - Pearlyn Oh. 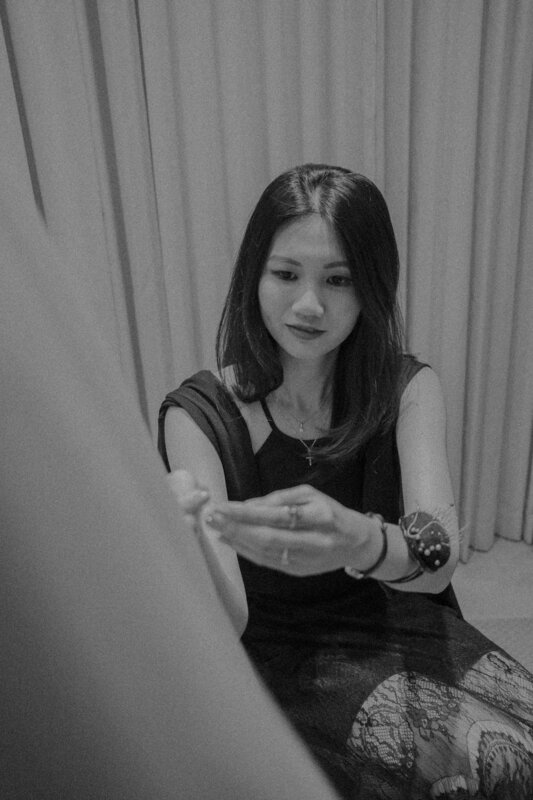 What begun as an internship when she was studying in Temasek Polytechnic's School of Design, has since grown into a career. After graduating, she stayed with the homegrown brand and honed her skills, learning from the likes of her seniors, Amanda & Miah. Today, she not only works with brides on a personal level, but is also managing the company's marketing communications and Amanda Lee's newest baby - Amanda Lee Online. There's more than meets the eye with this go-getter; read on to find out. Like most millennials, Pearlyn's choice of career started with a dream that she realised when she was a child. "I’ve always loved drawing and crafting since young, and somehow found passion in hand-made stuff. By 14, I already knew that I wanted to pursue fashion, and bridal was a good match of both fashion and craft." 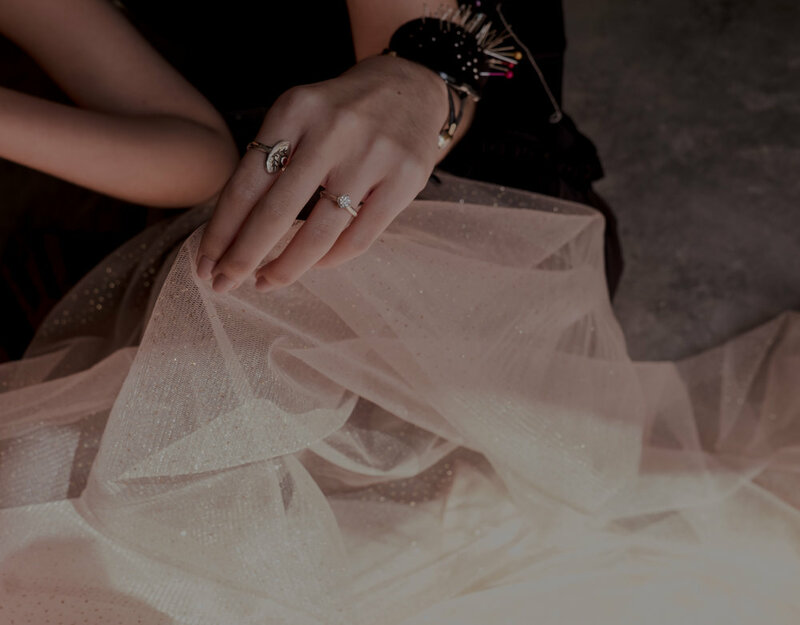 What started out as plaything has become Pearlyn's bread and butter - and years into designing dresses, Pearlyn has become a go-to for brides looking all things sweet and romantic. "Brides have been asking me for pastel coloured gowns, or to incorporate some pastel details on a white gown. I guess it works well for me as I like subtle details when it comes to designing." The 27-year old is a firm believer of less is more. Finding beauty in the understated is what Pearlyn does best - and with her designs, it's never just about being on trend, but how you make it yours. "Honestly, I’ve never been much of a trend-keeper. I believe in individuality and working with your personal style. If you can pull it off with your own styling, it can become your signature." What most people don't know about Pearlyn though, is that this lady loves injecting a bit of rebellion in her designs. "My style...? Contradicting. It can be elegant but quirky, or it can be feminine, but masculine at the same time." and Pearlyn is anything but a damsel in distress. For starters, this independent young lady enjoys solace. "I like to be alone when I’m working on a new design. When I’m working on details for a gown, I like to have Masterchef on loop. But that doesn’t mean I can cook!" "I think that leaves me?" who claims she isn't always as sweet as she looks. But jokes aside, brides fret not - Pearlyn joins the ranks of Amanda and Miah when it comes to unpretentious craft. If it's one memory that's stayed with Pearlyn since joining the boutique, it's got to be this. "Some years back, I had a client who was sick during the wedding preparation. During one of the fittings, she had her bridal make up on, and did her hairdo with the aid of a wig. When she wore the gown, she looked so happy and beautiful that I could literally feel joy piercing through my heart. It was something I will never forget, and a constant reminder that however mundane we designers may feel on some days, what matters most is the ability to bless someone with our gift. I hope she is still well." 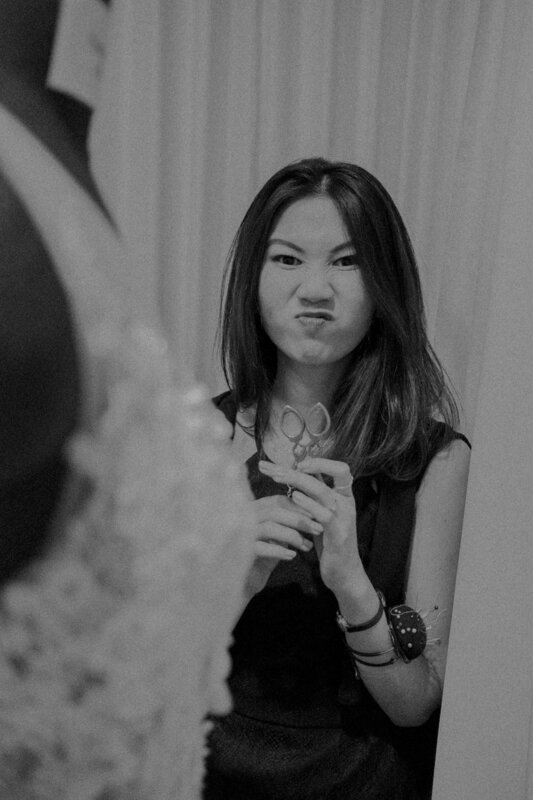 Perhaps it's this strong personality of hers that's allowed Pearlyn to juggle not just making gowns, but also manage the marketing of Amanda Lee Weddings, as well as ALO. ALO is likeminded with ladies who are looking for ready-made glam - all within the comfort of shopping online. Pearlyn wears a black full lace dress from ALO. What's ahead is something that Pearlyn has dreamt about as a child, and is finally about to become reality. This belle is about to wed her long-time beau in December, and the team at Amanda Lee Weddings cannot be more excited! And to prove just how excited we are, the team is attempting something that we've never done before. For once, Pearlyn isn't the one making the dresses. Tell us the story behind Amanda and Miah making your gowns in secret! "Amanda is the one who came out with the idea. They (Amanda and Miah) have been planning for my wedding for years, constantly coming out with newer (and crazier) ideas along the way. I feel very safe and blessed knowing that I’m in super good hands as I have the best team behind me. I can’t wait to see the gowns on the wedding day itself!" Now we know what you're thinking. The team's love for surprises have propelled them to come up with the most "creative" ways to keep Pearlyn's dress a secret, even when she's trying it on. Even we don't know how the gowns look like! One of the best things about planning a wedding, is choosing what to wear. We've seen brides laugh and cry during the process, and we understand a bride's choice is the most important. So is Pearlyn nervous about the outcome? "Like most young girls, I grew up with a princess fantasy, and I’ve always thought I would wear a ball gown for my wedding. But over the years, it’s really hard to pinpoint one dream gown when I've been constantly surrounded by so many beautiful dress. Whatever it is, I know the dress will definitely make me feel beautiful and I can’t wait to see it!" Like a true girl-next-door, Pearlyn is all chill and enjoying the rest of her wedding planning. "Not having to worry at all about the gowns has gotten a huge load off my wedding planning process, and I can only imagine the stress on my team for my wedding!" Well Pearlyn, you're about to become the first bride who surprises herself on her big day. We know you'll look stunning in whatever Amanda has in store for you! Find out more about Pearlyn and her creations at Amanda Lee Weddings by making an appointment with us.